In Information to Intelligence, I mentioned a process of progressive discovery of actionable intelligence from information streams. Our approach was to filter information based on relevance to your organization/business at every step of a multi-step process. Today while going through some material on Semantic Web, I came across this nice presentation from We Know It. We know it caught my attention since they were talking about collective intelligence (an interest area of many of us at Program for the future). 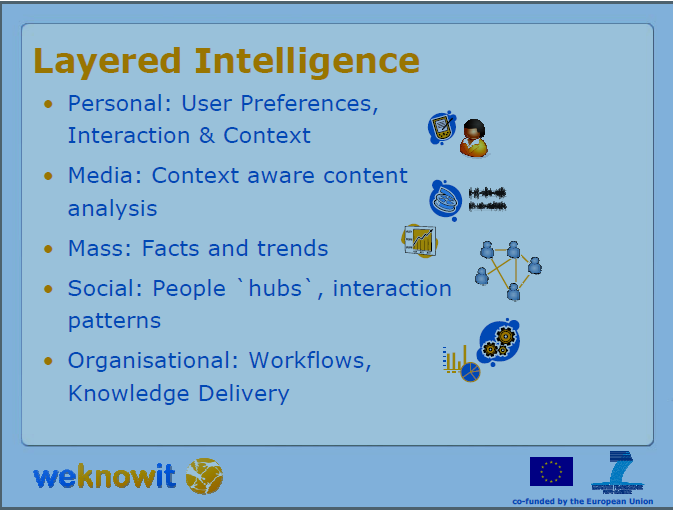 Here is a copy of the concept of layered intelligence from the presentation. Reflections: How Much Knowledge Do You Need? I was listening to the Tech Nation Podcast where Moira interviews Chris Mooney, the author of Unscientific America. The book deals with a fascinating topic – How Science illiteracy threatens our future. Chris mentions that if you are in the “know”, you are in a privileged position. This goes beyond Science Literacy into Information Literacy. So let us ask the question differently. What is the minimal knowledge you need ? And how do you plan to acquire it? Thanks to the internet you have lots of choices. The problem, however, is too many choices. Where do you start? How do you proceed? What exactly do we mean by Information literacy? What is it to a common man? To a Professional? To a Business? A couple of days ago, I heard John Carter’s Fire Your Boss and Start Consulting. I loved his simple style and great insights about the consulting business. A few jots from the podcast. Hourly rates or Fixed Project based rates? Please feel free to add your take on consulting as well in the comments section here. We have been enjoying the benefits of Google Search and Google Trends. Once in a while, Google comes up with some interesting tools that gives us a peek at what you can do by tracking search trends. A search provides some insight into interests and sentiments. By tracking a large number of searches and identifying search patterns, you can get some glimpses into mass sentiments. Google’s Domestic Trends is an amazing service. Google Domestic Trends track Google search traffic across specific sectors of the economy. Changes in the search volume of a given sector on google.com may provide unique economic insight. You can access individual trend indexes by clicking on the left-hand navigation. When you look at trends of searches people do, you get a very high level view of the sentiments. Google provides this for US, Canada, UK, China and Hong Kong. It is amazing that you can download some of the data into your spreadsheets for further analysis. How do you find relevant sources of information? How do you track it consistently? How do you filter through the noise and produce useful information streams for different groups in your company? How do you extract useful entities (company names, products, leads, projects, jobs) from this stream? How do you aggregate it, share it with different groups inside and outside the company like colleagues, customers, partners? 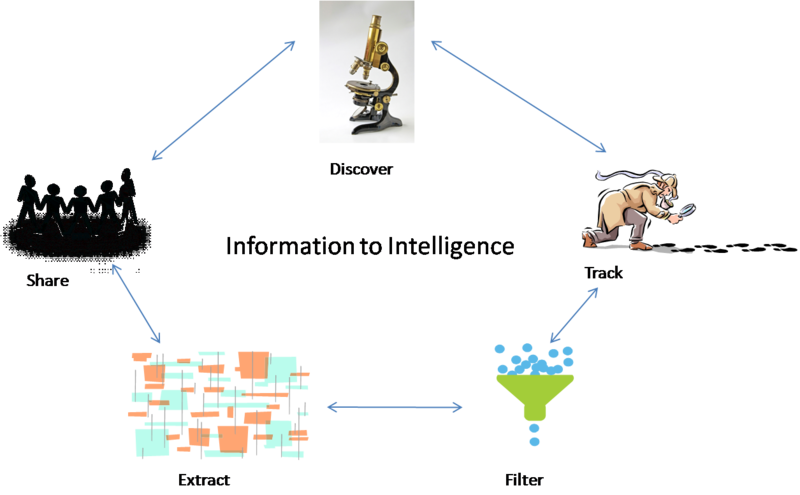 In short, how do you turn the information torrents into actionable intelligence – Marketing Intelligence, Sales Intelligence, Competitor Intelligence, Industry Intelligence? We are a building some of these. But I am always interested in finding out what others do.